Regrow Hair With The X5 HairLaser | OhGizmo! From The Road: We Have A Winner! I have a full head of hair, and am proud of it. Granted, I’m only in my 20s, so it’s not really all that amazing that I’m not showing any signs of baldness or even a receding hair line. I love my hair, so I would be devastated if I started losing it. Like many others, I would likely turn to crazy gadgets like this one for help. The X5 HairLaser blasts “15 distinct points of coherent laser light directly to your scalp at the optimum power and wavelength,” which is supposed to promote hair growth. You’ll need to do this for 10-15 minutes three times a week. 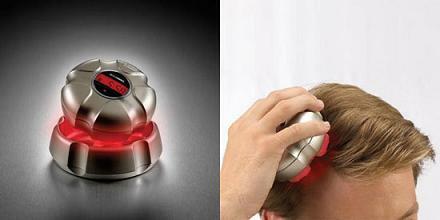 $300 might be a bit much for a gizmo, but if it will actually regrow hair it would be more than worth it. If it doesn’t help, you’ve got six months to return it. I just use my optical mouse…takes a bit longer, but it’s just as useless.